Specially designed for Elevator Motors is our new AH800 Rotary Encoder. 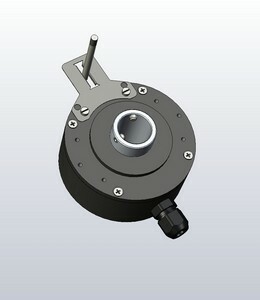 With an outside diameter of 80mm and a shaft size of 20mm, the Encoder can be fitted direcly onto the B-Side of a Motor. Thether and clamp prevent the housing from rotation. This optical Encoder comes with Standard 13Bit Resolution absolute and an SSI-Protocoll.